Around 10 years ago I saw a very drunk journalist try to pick a fight with Piers Morgan. He has that effect on people. The occasion was the black-tie annual British Press Awards and Morgan – who will fill Larry King’s interview slot on CNN from January 17th – was editor of the Daily Mirror newspaper at the time. I don’t know what had riled the inebriated hack but he was baying for Morgan’s blood. Self-assured to the nth degree, Morgan was completely unfazed by the verbal assault and looked more than capable if it had become physical. Somewhere in the drunk’s sozzled head, there had to have been a surviving sober brain cell that told him it would be unwise to cross Morgan. He staggered off into the night disappointing a good number present who would liked to have seen Morgan’s ever-present smile wiped off his face. This occasion is not to be confused with the year at the same awards – which I missed - when Jeremy Clarkson punched Morgan over articles about the Top Gear presenter's private life. Morgan had a chequered career at the Daily Mirror. One reason he switched from newspapers to television was because he was sacked in 2004 after publishing fake pictures of Iraqi prisoners being abused by British troops. Those in America who only know Morgan as a judge on America’s Got Talent and The Celebrity Apprentice are in for a surprise. When he stops freewheeling and calls on his long journalistic experience, as in his travel documentaries and star interviews, Morgan makes riveting television programmes. He is a laureate in today’s celebrity culture. His supreme self-confidence would be maddening if you had the misfortune to be locked in an elevator with him. But I’m sure it will be put to good use when prising secrets from his guests. 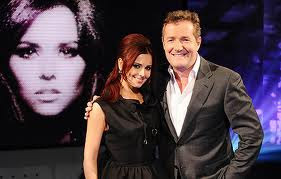 He managed to make even Cheryl Cole interesting in a TV face-to-face a while back. So opening Piers Morgan Tonight with Oprah Winfrey should be a piece of cake. He also managed to keep Lord Alan Sugar very relaxed, on a one and a half hour special. Actually. GC. Piers is very formulaic, all scripted, one paced and predictable. Next time you spot genuine interest in and warmth to his subjects, then flag it up for us all. You'll agree then with the now-published 1998 diary entry by Alastair Campbell, Tony Blair's press secretary, after the PM was interviewed by Morgan for the Daily Mirror: "TB said he was basically a slug but he was clever, and we shouldn't over-alienate or underestimate." Absolutely. Anybody who survived the Daily Mirror doctored photos scandal,[albeit losing his job] to go on to recreate himself on X factor and as an independent interviewer, and is a self confessed tax exile in Monacco, plus has has now taken over the USA.s top chat show has got to have friends in high places. Ratings ared well down currently on his USA chat show, 31 Jan 2011.